Apple season hits us in the fall with a desire to pick em and eat em as fast as we can! 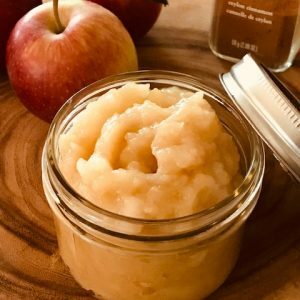 Since the kiddos can’t always chomp right into a whole apple make them applesauce and call it ‘dessert’…which also applies to anyone else, of course. Place the apple chunks in a large, heavy-bottomed, stainless-steel pot. Add the rest of the ingredients. Bring to a boil over medium-high heat, stirring occasionally. Simmer until the fruit becomes tender, about 20 minutes. Mash with a fork or puree apples in a food mill or blender. *In Ontario we get bushels of Macintosh, Courtland, Jona Gold and Gala that are always great for eating, so it doesn’t matter when it comes to making applesauce, although my preference is a less sweet-more tart apple, like Courtland. Totally up to you though. Try a mix if you like!